Many men find it difficult to define their mid-section into a 6-pack, regardless of rigorous workouts. 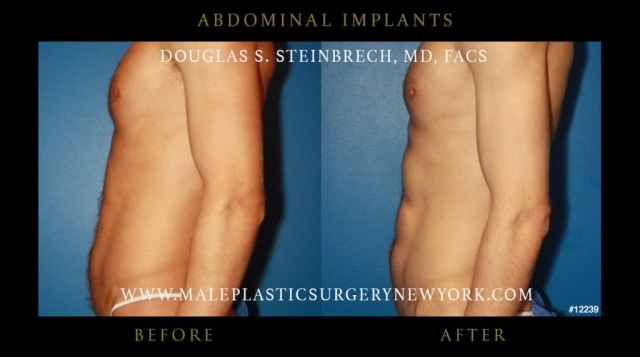 The 6-pack implant is a procedure providing a shortcut that can give you the tailored, defined abs you have been dreaming of. No matter how disciplined you may be with your gym regimen, some men find themselves at a stand still that no amount of sit-ups, crunches, and even diet can help them to achieve their ultimate goals and progress. Genetics sometimes work against us, and a secret weapon is needed! 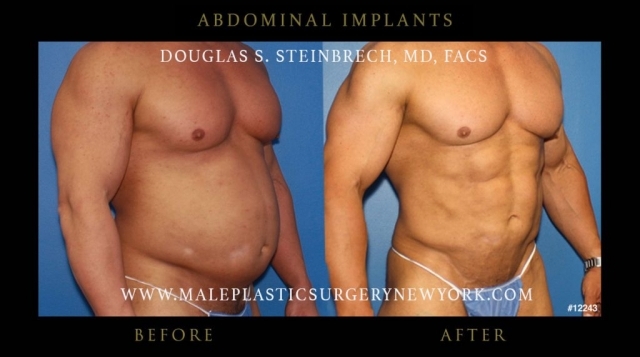 Abdominal implants are the alternative procedure to abdominal etching, in which the look of a 6-pack is created through liposuction like an artist’s sketch into the abdominal region enhancing muscle definition and providing the tight stomach. 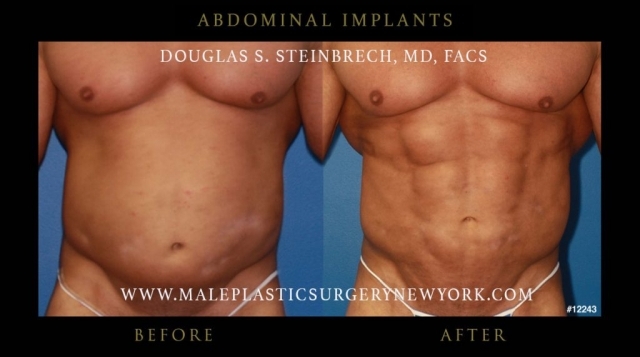 In abdominal etching, excess fat stores are removed and grooves are contoured in the remaining layers designing the look of fully toned abs. Abdominal Implants take it one step further, actually placing implants throughout the region, providing an even more defined and structured appearance. 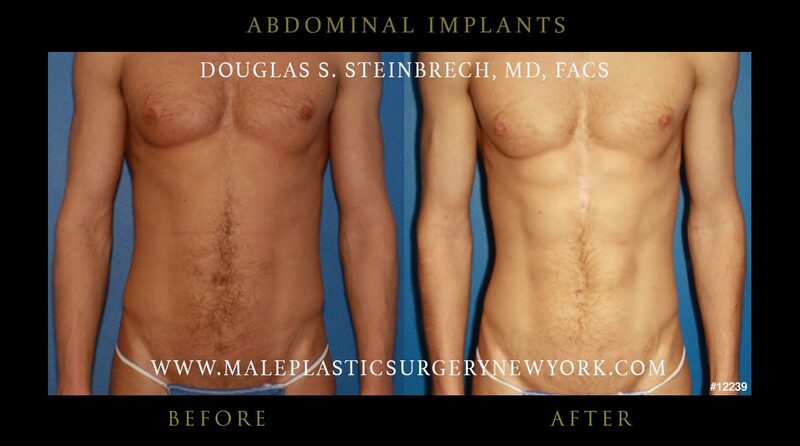 To view before and after photos from NYC patients who had abdominal 6-pack abs implants surgery performed by Dr. Douglas Steinbrech, please click on each thumbnail to enlarge to full size image. Through two small incisions, six to eight individual implants can be placed to the abdominal area. 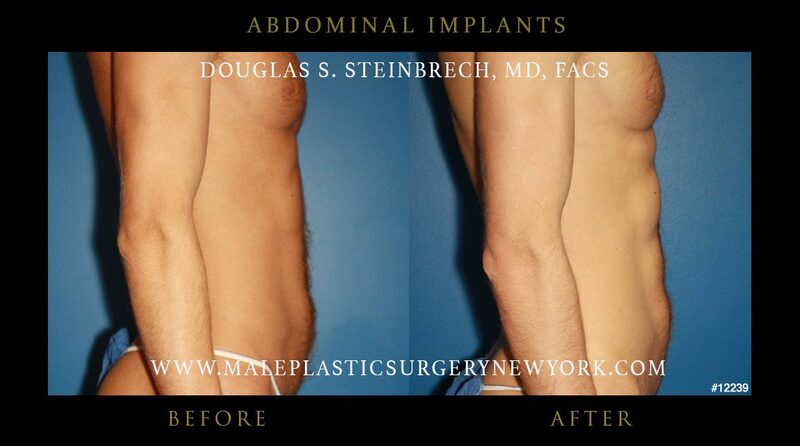 The implants are soft, flexible and made to move with your body. This will offer a more natural look and still allow you to continue with your bodily activity. 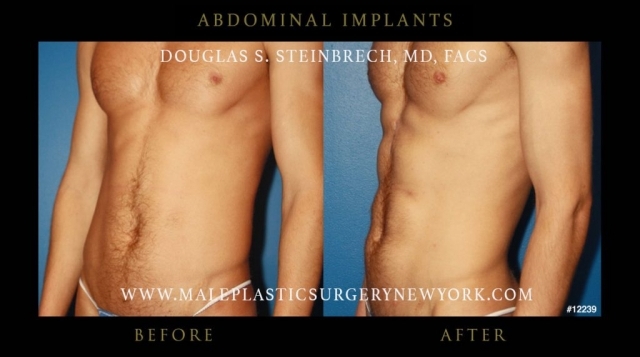 This option is often coupled with a tummy tuck procedure to offer easier access to abdominal muscles before insertion of the implant. Anesthesia is required for the procedure. Bruising, swelling, and temporary aches may occur. In most cases, the side effects will subside in about a week. You may resume light activities two to three days after surgery. Heavier physical activities, such as gym workouts may be resumed in four to six weeks. For more information about 6-Pack Implants for men in NYC, please call (646) 480-7750 or visit Dr. Steinbrech’s clinic to set up your no-obligation consultation today.